Schaffer’s Store is a two-and-a-half storey utilitarian commercial building constructed circa 1902 in the vernacular and is situated on the east side of Main Street within the Village of Blackville’s service district. Schaffer’s Store is designated a Local Historic Place for its association with store merchant and mill owner Moses Schaffer. Schaffer was an Austrian who immigrated to the Miramichi area in 1891, venturing into the merchant trade. Several years later his wife and child immigrated, and he established a dry goods and clothing business trade here along with a reputable name. His life met some partiality due to religious affiliation, yet he overcame this adversity and was fiercely proud of his Canadian citizenship. The business stayed within the family for a half century and operated under his son-in-law’s name, Shea Guttman. The store received two additions to the main structure during commercial growth in its first two decades, amounting to a village storefront of relatively immense size for this village. The family occupied the upper level of the building. 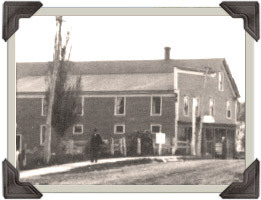 Schaffer’s Store is also valued for its association with later owner A & R Loggie Co. Ltd., a nearby firm of humble beginnings that had grown to a compliment of regional industries and overseas markets. Schaffer’s Store has functioned as municipal offices and residential dwellings in later years.